This is the landing page for all Scott County budget information. Scott County has an annual budget of nearly 75 million dollars. Property tax is the largest source of funding for the county. Scott County is known for its fiscal responsibility. While ranking third in population, Scott County ranks the among the lowest metropolitan Iowa counties tax levy rate. Additionally, Scott County remains one of the counties with the lowest property tax amount per capita. There is a wealth of information in the budget plans, summaries, quarterly indicators, and audits contained on these pages. If you have any questions, please call the Scott County Budget & Administrative Services Director at 563-326-8651. 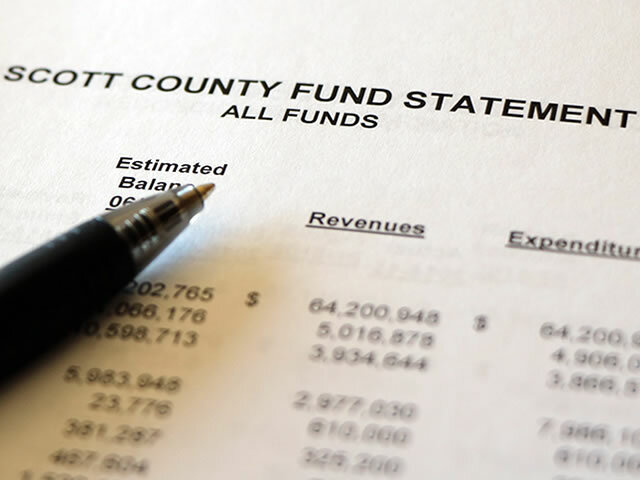 Scott County's Fiscal Year begins July 1st and ends June 30th. Today, Tuesday, April 23rd, 2019, is in the 4th Quarter of Fiscal Year 19. 4th Quarter of Fiscal Year 19.